I was provide the below mentioned product in exchange for my honest review. When you first find out your pregnant all kinds of thoughts run through your head. Of course you think about what your baby will look like, if its a boy or a girl, what kind of parent you will be and so on. But sooner or later your thoughts go to what products will you need for baby. Everyone is different in their thinking around this, but one thing everyone knows is that they want the best for their baby. I am always on the look out for the best items for my boys. I recently learned about a store that brings together the most extraordinary children's furnishings in the world into one place. I was so excited to be able to work with PoshTots on a review. PoshTots has so many beautiful items I am not really sure where to start. You can furnish and decorate a whole nursery and beyond. PoshTots brings together exceptional artisans and parents who appreciate their unique creations. A child's room is so many things including a place to play, learn, and dream. Creating the perfect space is not easy, it takes finding just the right furnishings and accessories to bring out a child's unique personality. The talented team of designers at PoshTots have earned the reputation as the "designer of choice" for celebrity parents as well as other clients across the globe. PoshTots has distinctive style, wonderful customer service, and a commitment of the finest craftsmanship for the most extraordinary children's furnishings in the world. Dry clean only. Spot clean liner with damp cloth. I am in love with this diaper bag, not even kidding. This is my second child and I have had quite a few different diaper bags and this is by far the best one I have ever had. It is beautiful and practical for use. It has plenty of room to hold all I need with room to spare. I use cloth diapers so diapers take up more room then disposable and yet I still have plenty of room. The built in changing station is helpful for changing Evan on the go. 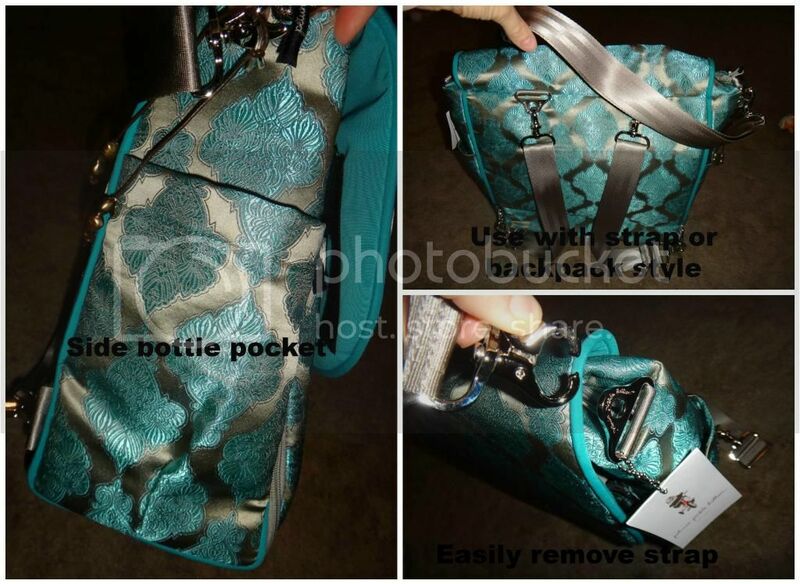 When I am out and about I love carrying my PoshTots exclusive diaper bag. I have a friend that has already told me that when she decides to have baby number 2 the first thing she is going to do is steal my bag. Looking at the PoshTots site there is so much to love. There are endless possibilities to choose from. If your in search of a beautiful diaper bag like the one I received or an elaborate playhouse for you child then PoshTots is the place to go. They have so much to choose from to help make your baby dreams come true. Stay connected with PoshTots on Facebook, Twitter, & Pinterest. Thank you to PoshTots for sponsoring the review. i love the color! that is gorgeous! That is a beautiful diaper bag - I don't usually like many diaper bags, but this one is really cute. Thanks for sharing. That bag is absolutely beautiful! I have always wanted a Petunia Picklebottom bag and this one really takes the cake. Thanks for the great review. This would make a great Mother's Day gift! That bag is GORGEOUS! 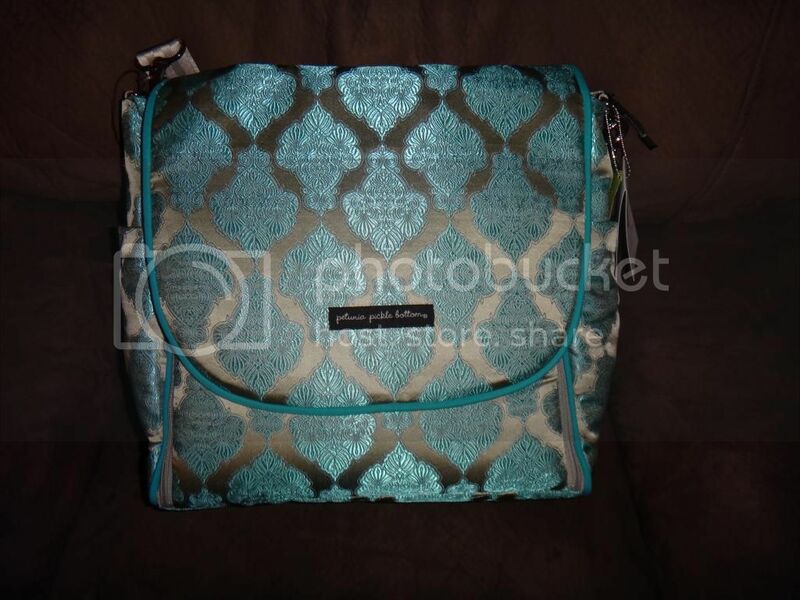 I love the color and the pattern, I don't even use a diaper bag anymore, and I STILL want it! Great diaper bag! That's pretty enough for me to carry camera equipment in! It would make a fantastic camera bag! I like that the bag is so versatile and beautiful, great colors! what a beautiful bag...i love it...love the color...thank you for sharing.